TA-DA!!! We are open for business y'all! To celebrate and to show it off, last month we invited local (and some not so local) wedding vendors to a Southern Shindig. We had a blast! But seriously how could we not? Yummy, soul food, great music, and cool folks is always the perfect recipe for a great night! Thanks to a "not so" local wedding vendor and new friend Christina for IG'ing our invites. Our invitations were designed by our friend, Whitlee Mullis. Have I mentioned how talented this girl is? I know I have and I'm sure I will probably say it a million more times. Through the rebranding of Le Rae's, we have become BFFs. She is one of my sounding boards for most, if not all, of my "big fat dreams". This chic is always honest, brutally at times. One of the first people I called about the shindig, was Whitlee. Our chat went something like this... ME: "I want to have an open house for wedding vendors. What do you think?". Whitlee: "Do I get to do the invites?" Me: "DUH!" Whitlee: "I think it's a great idea." Aren't they adorable?! They turned out great! Just look at that envelope liner! My next call was to the other member of what we like to call #teamawesome....Wes Roberts. Him being there was an absolute MUST! Thanks so much to him for these amazing images. A big fat thanks to my mom and the Red's crew for cooking this delicious southern spread. My brother, Bert frying cornbread and green tomatoes. Hey Bert, where is your bow tie? Our dessert table consisted of 'nana pudding bites, pecan pie, caramel apples, mini apple tarts, and mini cherry crunch (aka the star of the show). Of course, I didn't want to do anything "normal" and decided instead of having regular tables we could hang pallets from the 16" ceiling to use as food stations. Poor KC! Whitlee designed these adorable "Hey Y'all" prints that we used everywhere! What about linens you ask? We made them from painter's drop cloth. Turns out they were the EXACT match to all of our paper pretties! So many great folks joined us! This guy below may have been the most popular person there. This is Jay Mullis (Whitlee's brother). I could listen to him play for hours! Watch out Ray LaMontagne! Check him out on YouTube. AND A WHOPPING THANKS to Mr. and Mrs. Hicks for letting us borrow their gorgeous car. I am so thankful for each and every one of you that helped, supported, and cheered us on through the entire process. And to everyone who came and partied with us! Posted on November 15, 2013 by Rae Culver and filed under The Barn at Pisgah Hill, Big Fat Dreams and tagged the barn at pisgah hill lerae events and design southern food southern shindig fried green tomatoes Fried cornbread banana pudding bites mini cherry crunch wes roberts photography Whitlee Mullis Designs #teamawesome Big Fat Dreamer. 10 days y'all! That is all we have left until our first wedding at The Barn at Pisgah Hill! Time has flown by and we will be busy little bees until the last second. Earlier tonight my sister in law and I rode to the barn to turn off a light. She was commenting on how great everything is looking. When we were walking out the door, she said something pretty amazing. She said "Rae, you do realize this is not normal?". I knew what she meant and responded "yes, I know". You see, I know that a six figure piece of property I longed for didn't just "happen" to go into foreclosure. I know that easy financing didn't just "happen" (literally) overnight. I know that a ridiculously skilled man (and fellow big, fat dreamer) didn't just "happen" to offer to help. I know that my hubs didn't just "happen" to get laid off during the crucial building time. AND, I know that God is up to something big. As we were pulling out of the driveway, my sister in law made another profound statement. She said, "Rae, don't you love how God always spoils you? You are so blessed". And again I answered, "yes, I know". Y'all stay tuned! I have lots of pictures of the construction of the barn and I think I may even have a video clip to post! Posted on September 12, 2013 by Rae Culver and filed under The Barn at Pisgah Hill and tagged Le Rae Events and Design the barn at pisgah hill Romans 8:28. What a weekend! From Thursday to Saturday I put in almost 45 hours. 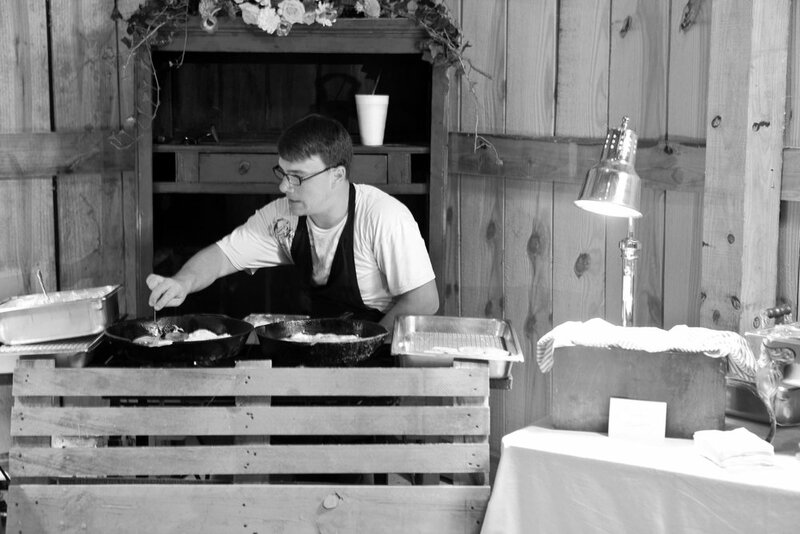 We did a fabulous wedding in Troy, Alabama. It was gorgeous! We met some new, awesome vendors and walked away with a happy couple and parents! I will definitely post pics and stories soon! But today, it's all about HIM. If you follow me on Instagram, you may have seen a scripture from one of my daily devotionals out of "Jesus Calling" by Sarah Young. It was Proverbs 16:9. But when I read it, it was verse 7 that caught my ATTENTION! even your enemies will end up shaking your hand. than to be wrong and rich. Oh, I LOVE IT!!!! It's so awesome! How stinking amazing is verse 7?! What a promise! When God is on our side NOTHING can stop us! It's like Romans 8:31-32, "What shall we say about such wonderful things as these? If God is for us, who can ever be against us? Since he did not spare even his own Son but gave him up for us all, won’t he also give us everything else?". OMG! WHAT A REMINDER! Want to hear something even cooler? This devotion was on June 18th (last Tuesday). And little did I know, but God was preparing me for a situation. This weekend I got a call about a little negativity towards me and The Barn at Pisgah Hill. I have to admit on most occasions it would have sent me straight into "what if-ville". What if this happens or what if this happens or what about this or this or this. But not this time. I simply said "You know what? It doesn't matter." The person I was talking to knew EXACTLY what I meant and simply said, "I know". You see, I KNOW God has had his hand in this barn from DAY 1. From the location of the land (295 feet from our house), to the crazy low price on the property, to the easy financing, to the tremendous support and help by family and friends. Still not convinced, how about the fact that the hubs had almost 3 weeks off because he was between jobs right at the exact moment they were planning on starting construction? SO, my point is God's favor is there! It's smothered in IT! ;) And if this is true, do I really think he's going to stop now? Of course not! Do I think it will sit empty? Absolutely not! Why? Because when God approves of my life, even my enemies will end up shaking my hand! Posted on June 25, 2013 by Rae Culver and filed under Life Lessons, The Barn at Pisgah Hill and tagged Jesus Calling proverbs sarah young the barn at pisgah hill Pisgah Hill The Le Rae Life. On my way to work Wednesday evening (I work once a week as a nurse), I drove to the land to tell KC bye. THIS is what I saw. The FIRST pole being raised. I was ecstatic and mad at the same time. I jumped out of my truck and yelled "I can't believe y'all are going to start this knowing I have to go work tonight". They knew I was "jokingly" mad. They all grinned. Mr. Frank looked at me with that smirk of his, and said "you just wait until you get home tomorrow". It was SO hard for me to get back in my vehicle and drive to Montgomery and miss it all! When I got off of work Thursday morning, I had a few errands to run. Although I had been awake for almost 30 hours straight when I got home, I couldn't lay my head down until I got another look at their progress. WOW! In that short time, one pole had turned into a whole wall. 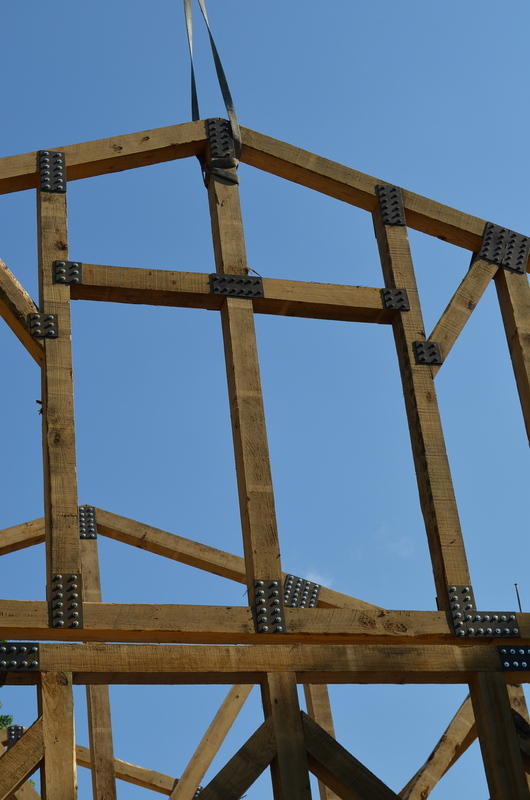 They had also raised 3 of the 6 large poles that will hold the half ton trusses. I was in awe of the size of it all. Word on the street is that by Sunday evening this 52 x 60 rustic barn will be framed. I cannot wait and of course I will post pictures for those of you who can't see it in person! Y'all pray with me for God to give strength and safety to all of these awesome men helping make this big fat dream come to life! 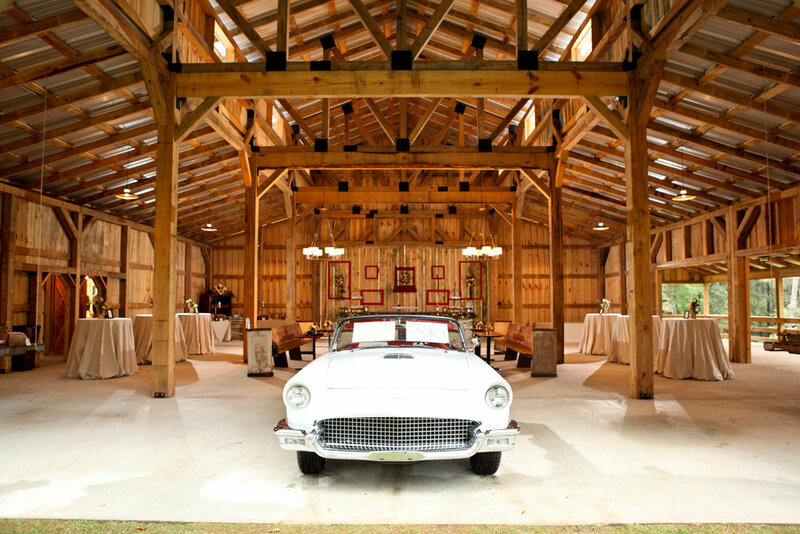 Posted on June 14, 2013 by Rae Culver and filed under The Barn at Pisgah Hill, Big Fat Dreams and tagged Pisgah Hill barn wedding venues barn weddings in montgomery alabama The Le Rae Life lerae events and design isaiah 40. You might remember me blogging about hiccups a few weeks back. Well, the Le Rae hiccup I was referring to was an event that was supposed to take place today (ok its now 2am so yesterday). Long story short, we lost that event. When you pour your heart and soul into a design and it doesn't happen.....it's tough! One of the best parts of this "job" is seeing what's in your head come to life! ANYWHO......when I woke up today, I made the conscious decision to be happy and productive! Which meant.....do something crazy, do something fun, do something I love, do something meaningful, STAY AWAY from social media, and get stuff done! MISSION ACCOMPLISHED! Do something crazy.................check! I slept til 9 AM!!!! I know, I know this doesn't go with the "be productive" plan, but it felt GREAT! Do something fun.....................check! I spent time with my hunny bun (Hunter my 10 year old son) and we had a short but sweet shopping trip. Do something meaningful.....check! I took a 4 wheeler ride with my 80 year old Paw Paw on Pisgah Hill! The original clean up of this property was done by him when he bought it years ago. This little ride could also count for "do something crazy". I wanted to look for great ceremony spots and he thought it would be ok to drive us straight down a steep hill! SCARED me to death....but we made it. Get something done.....check! We (LOL) staked off, squared up, and dug holes for the barn. I deemed it Breaking Ground Day! Do something I love.....check! I spent the evening with my partner in "wedding crime" (Leah). Over dinner and a glass of wine, we started designing two of our upcoming fall weddings! Give me a pencil, some graph paper, and someone to bounce off ideas with and I am in heaven! I snapped the above picture while I was pulling out of the driveway at Pisgah Hill. I posted it with this caption. I meant every word. I have been quoting Psalms 37:4 like crazy the last couple of days (“take delight in the Lord, and He will give you the desires of your heart”). After "taking delight in HIM" today, He fulfilled His promise and blessed me with a desire! At midnight I checked my email. There was a message letting me know one of our photo shoots with Wes Roberts had been featured on Love Wed Bliss Wedding Blog. AMAZING and once again leaves me completely #inaweofhim! Posted on April 7, 2013 by Rae Culver and filed under Life Lessons, The Barn at Pisgah Hill and tagged lerae events and design barn weddings barn weddings in montgomery alabama barn wedding venues #inaweofhim Psalms 37:4.